All the Inside Pics & Deets from Prince Narula and Yuvika Chaudhary’s Sangeet night! 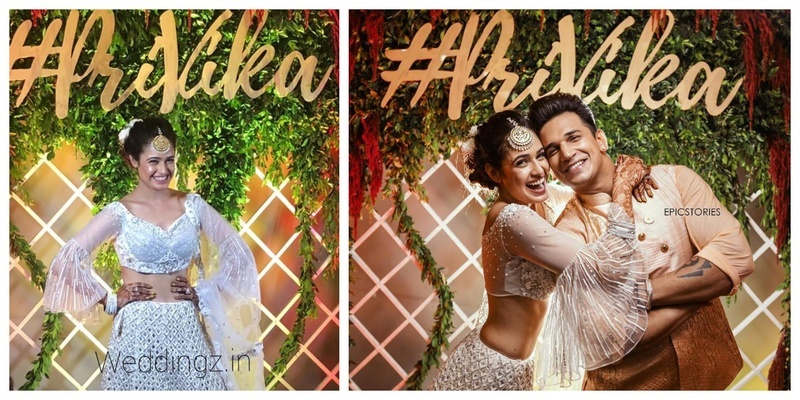 After their grand mehendi and engagement ceremony the television sweethearts - Prince Narula and Yuvika Choudhary hosted a ‘grander’ cocktail and sangeet last night! The whole world of Television was there to celebrate with the couple and the night was filled with some really dramatic dances, fun and quirky pictures. Attending the festivities were - Rannvijay and Prianka Singha, Keith Sequeira and Rochelle Rao, Karan Kundra and Anusha Dandekar, Priyank Sharma, Mandana Karimi, Rashami Desai, Kishwer Merchant and many others graced the occasion. Also, did you see that uber cool decor behind and the hashtag - Privika behind them? I for one am totally loving how Q Events made that possible! Totally crushing over her all-white Kalki heavily embellished lehenga with sweetheart neckline and sheer-bell sleeves! Totally stunned by how she decided to ditch all the jewelry and oped for a statement maang tikka, bangles, floral bun and minimal makeup! With a sangeet ceremony like that, here’s awaiting the big-fat Punjabi Wedding scenes!